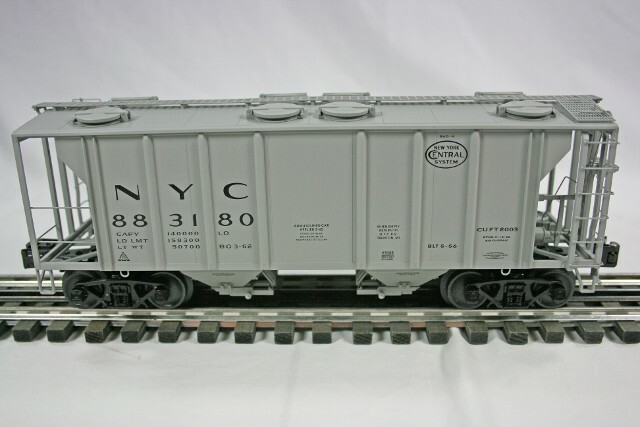 This New York Central standard "O" PS-2 2-bay hopper was manufactured by Lionel in 2006. 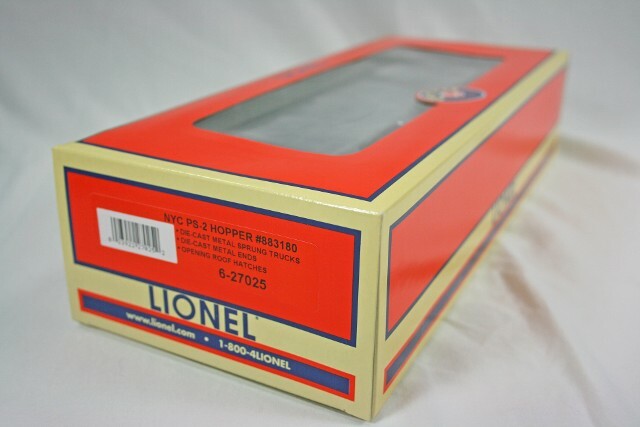 This top of the line hopper was new to Lionel in 2003 and was an instant sell-out. It is a very detailed prototype of modern railway hopper with dozens of hand applied details that are no more than molded details on earlier cars. The more you look, the more details you find. Begin with 11 hand-applied step ladders at each end of the car, hand-applied walkway grates on top of the hopper running the full length of the car, hand applied latches on each of the eight opening roof hatches, and a hand-applied brake line running the full length of the car. It has a metal brake wheel with hand applied brake lines and air tank at one end, plus for hand-applied hanging steps, one at each corner. The underside hatches contain an equal amount of detail and it rolls on all metal sprung trucks with metal wheels and axles, operating metal un-coupler plates, integrated into the truck (far better operationally than the "thumb-tack" version of the past 30 years) and knuckle couplers at both ends. This car is in "factory fresh" condition (i.e. "Mint", "brand new", "never been on the tracks or displayed"), “new” old stock. The car was issued in an orange & blue Lionel windowed box. That box comes with this car and also is in Mint condition.